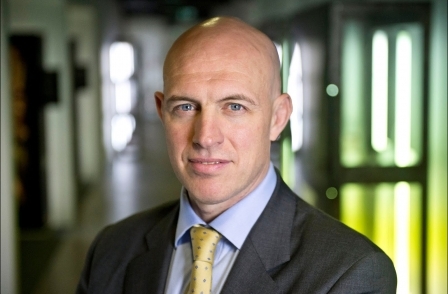 New Sun editor David Dinsmore is known to his many friends and colleagues at News International as ‘Dins’ or ‘Dinsy’ – though Press Gazette suspects most will now be calling him ‘Boss’. Many were surprised at his shock promotion last week to editor of The Sun from his role as News International director of operations (a non-editorial job in charge of printing and distribution). But all who Press Gazette spoke to were pleased for him and said it was a move that made sense given his wide experience both at the ‘coalface’ of journalism and in management. Glasgow-born Dinsmore, 44, was privately educated at Strathallan School, near Perth in Scotland, and left after A-levels to pursue his journalistic ambitions. His career nearly fell at the first hurdle when he was kicked off a two-year journalism course at Edinburgh’s Napier University one year in (after failing to pass his 80-words-per-minute shorthand by the required point). The Clydebank Post gave him a job anyway and he later worked as a reporter at the Eastwood Mercury, Milngavie Herald and Kirkintolloch Herald. Dinsmore eventually passed his 100 words per minute shorthand after what he said was the 25th attempt continuing his studies at secretarial college. Dinsmore enrolled in a business management degree at Paisley University in 1991, while also working nights as a casual reporter at the Scottish Sun. He got his first national press staff job on the Daily Star in Edinburgh before joining the Scottish Sun as a reporter in February 1994 (he has stayed with News International even since). He progressed via the production route, becoming a sub-editor and then chief sub at the Scottish title, and made the move to London after becoming picture editor of the News of the World under Phil Hall. There, he went on to become News of the World night editor before holding the same job at The Sun (from January 2004 to 2006). As Scottish editor of The Sun from 2006 to 2010 he was in charge at the point the title (helped by price-cutting) overtook the Daily Record to become the best-selling paper in Scotland. During his time as editor its average sale dropped from 362,440 to 339,586 (but when he left it was comfortably ahead of the Daily Record, which at the point was selling 294,250 in Scotland). He was made interim general manager in charge of the whole of News International Scotland from October 2010 to December 2011 and was interim managing editor of The Sun from December 2011 to October 2012 (at a time when many Sun journalists were being arrested). One former colleague of Dinsmore’s said: “I think he’s a very good choice for the job. He went up to Scotland to run NI’s operations up there and came back very much the accomplished executive. “He’s been at the coalface but also has plenty of experience on the management side as well. Dinsmore's wide experience in various aspects of the media business may stand him in good stead facing his first challenge as editor, to move The Sun on to a new paywalled website incorporating access to near-live clips from the football Premier League. James Alan Anslow, a media academic now researching tabloid journalism at the University of Essex, was chief production editor of the News of the World in the 1990s when Dinsmore was in News International’s Scottish plant at Kinning Park helping to co-ordinate production. He said: “Dave was a disembodied voice at the other end of the phone. Matching Scottish and national NoW pages was a complex business, but I remember he was always almost annoyingly cheerful even early on a Saturday morning after we’d all been working almost non-stop through the Friday night preparing Sunday’s paper. Former News of the World chief reporter Neville Thurlbeck, who now runs TalentGB, recalls working with Dinsmore when he was picture editor of the now defunct redtop. “He was universally respected by everyone on the newsroom floor from the editor downwards, largely because of his sound judgement, clear direction and affable personality. “Everyone liked ‘Dins’ and it’s not often you can say that about someone who rises to the top. “My most outstanding memory of him? “David used to carry a lot more weight and I fondly recall standing behind him in the queue for the executives’ Saturday lunch trolley when he bent down to pick up a pork pie, splitting his trousers clean down the seat with an ear-splitting rip and revealing a large pair of brightly striped underpants. Interviewed for the NI intranet Dinsmore described going through the emotions of “surprise, excitement, terror and back to excitement” on getting The Sun editorship.